If you or your spouse served in the Military in 2012, you should know that there are some provisions in the tax code that will help you save some money. 1. First, combat pay is not subject to Federal income tax. Combat Zones are defined by the federal government under executive order, and currently include Arabian Peninsula Areas, Kosovo area, and Afghanistan. The lack of any family income could disqualify civilians from receiving any Earned Income Tax Credit (EITC). Even though the combat pay received isn’t taxable, it may be included as income for purposes of qualifying for the EITC. The EITC is based on income and the number of children you have, and may be as much as $5,891 for a family with three or more children. This credit is refundable meaning even if you have no tax at all for the year, you can still receive this credit. 2. The Roth Thrift Savings Plan was introduced this year providing an excellent alternative to the standard pretax plan that had rules similar to the private sector’s 401(k). As combat pay isn’t taxed, the ability to put some of this money into a Roth designated retirement plan will provide you and your family with a tax free benefit when you retire. 3. You may have taken a withdrawal from an IRA, 401(k), 403(b), or other qualified plan. If so, the 10% penalty for early distribution will not apply, only the tax that would normally be due for the non-taxed portion of the withdrawal. If this is your situation, I’m happy to share with you a unique opportunity, the ability to make up this withdrawal. You have up to two years after your active duty ends and are permitted to deposit these returned funds to an IRA even if it was taken from a 401(k) or other qualified plan. This transaction is reported on form 8606. A very nice, yet little-known benefit you might use. 4. For moving expenses to be a deduction for civilians, there are a number of requirements to meet. Not so for those on active duty. 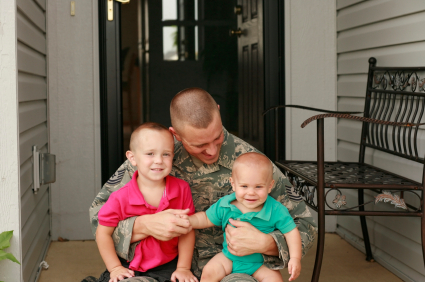 You are able to deduct the cost of moves from your home to your first post, moves from one permanent post of duty to another, and finally, for the move home within a year of your active duty coming to an end. Eligible expenses include the cost of moving household goods and travel costs for you and the members of your household. This includes your spouse and dependents. 5. If you are selling your home, the current test to take advantage of the $250K (Single)/$500K (Married Filing Joint) exclusion of gains is that you must have lived in the house for two of the prior five years. Members of the armed forces are permitted to suspend the 5-year look-back for as many as ten years. In effect, if you qualify for the two/five rule, the time you are serving will not let the five years get behind you. 6. Last I’d like to share that TurboTax has introduced TurboTax Military Edition. It’s free for those at a pay grade of E-1 to E-5. It will help you capture the tax credits and deductions that are offered to the men and women who have served.